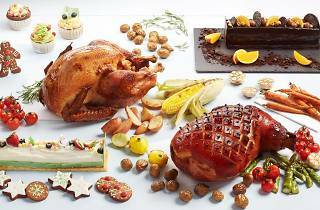 Book in for a Christmas ($65-$178/adult, $32.50-$74/child) or New Year feast ($65-$288/adult, $32.50-$119/child) at Seasonal Tastes at The Westin Singapore. Dishes on offer include house-brined maple-glazed ham, apple- and honey-glazed turkey, Nova Scotia lobster, roasts sliced to order, as well as fresh oysters and crustaceans. Over at Cook and Brew, get a taste of the season with servings of spiced mulled wine and Christmas-inspired cocktails like the cranberry-forward Kandy Krusher (from $15). 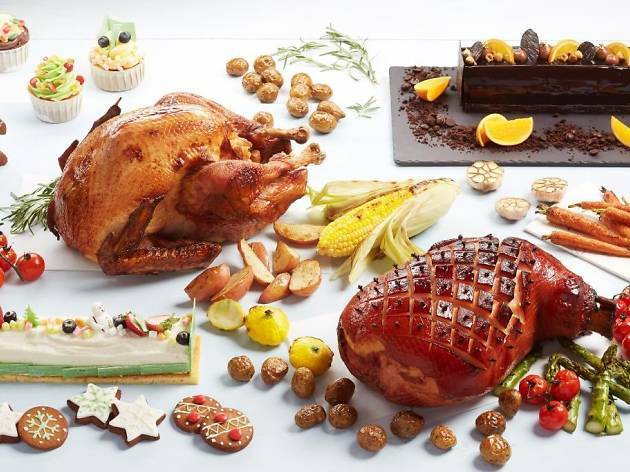 The Westin Singapore's pastry chef, Florent Castagnos, also gets into the festive spirit, putting his elves to work on yule logs like the dark chocolate and brownie-filled Chocolate Indulgence cake ($60/1kg), American cheesecake log ($58/1kg), as well as an array of chocolate treats and baked goods.